Go on an exciting adventure and compete in a thrilling 2D car race for fame, glory and treasures! Explore 30 obstacle tracks on a mysterious island and try to be the first to pass the finish line. Race against your opponents, perform cool stunts and collect coins, treasure chests and power ups which can give you a decisive advantage over your competition. Upgrade and improve your car or buy a new one with different stats in the shop to drive even better. Complete tricky challenges for permanent rewards and win the race! Welcome to our cocowebgameslicious HTML 5 cross-device game catalog. Here you can find more than 300 non-exclusive and exclusive licensed HTML5 games, reviewed, categorized and hand-picked for every taste. Feel free to browse through our games created by developers from all around the world. 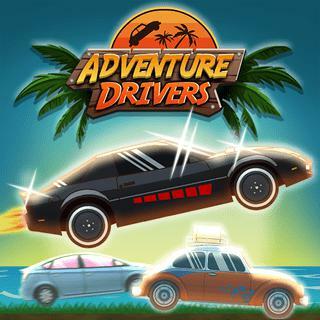 If you like Adventure Drivers games, you should check out the other games from our cocowebgameslicious game catalog. Do you need help? Why don't you check out our Help & Support category and see if your questions and problems can be solved.